I would describe my Scratch skill level as basic. Over the years, I have played with Scratch and created some basic projects along the way. I wanted to take every opportunity possible throughout the Creative Computing course to create as many projects as possible. The “Step By Step” project not only gave me the opportunity to start from the very beginning, but also work my way through the “Tips” area. I found that using Scratch along with the pop-out “Tips” feature, an easy way to get started. I decided to try different types of sprites, ones from the Scratch library, an image uploaded and a sprite created with the drawing tools. One of my favourite sites is IconFinder. Many of the icons on this site make perfect sprites. All of the icons are a good size and have a transparent background. Click here to view the “Step By Step” project. 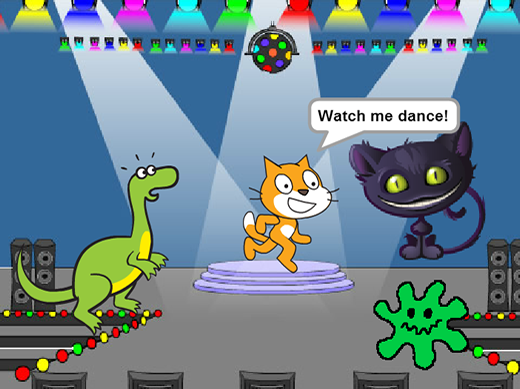 This entry was posted in Scratch and tagged CCOW, Creative Computing, Design Notebook, IconFinder, Scratch by Lucy. Bookmark the permalink.